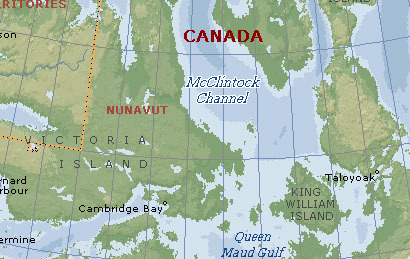 M'Clintock Channel (also spelled McClintock Channel) is located in the territory of Nunavut, Canada. The channel, an arm of the Arctic Ocean, divides Victoria Island from Prince of Wales Island. This channel is named after Sir Francis Leopold McClintock, in Irish explorer famous for his Canadian Arctic explorations. The channel is 170 miles (274 km) long, and between 65 to 130 mi (105 to 210 km) wide, making it one of the largest channels in the Canadian Arctic Archipelago. McClintock was born in 1819 in Kincora House, Dundalk and joined the Naval Service at the age of 12. He went on to chart much of the Arctic regions of Canada and to lead the successful expedition which discovered the fate of Sir John Franklin and his ships on their quest for the North West Passage. For this he earned his knighthood and the freedom of the cities of Dublin and London.